all the spots are filled! thanks to everyone who volunteered. my group of test knitters have had their pick of my most recent baby sweater patterns and there are two sizes of this one left: 3 mo. and 18 mo. see the information below. if you are interested in knitting this, OR if you’d like to be put on the test knitter email list to get emails when i need something knit, email me at cosymakes (!at) gmail (dot!) com. i cannot afford to pay, but you do get a finished copy of this pattern and one other pattern of your choice. i also often show off your project and/or link to your blog/rav project. A bell shaped kimono baby tee knit seamless from the bottom up, with ruffled short sleeves, ruching, and an organic climbing vine. 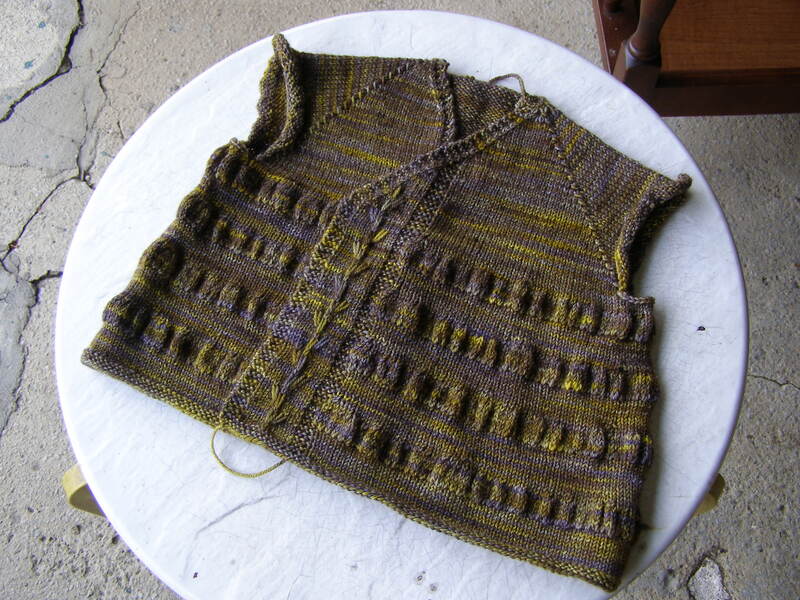 This entry was posted in baby, cosyknitsliterally, patterns, sweaters by cosymakes. Bookmark the permalink. I would love to test knit the 3 month version for you! I have a little bundle coming in October and am in love with knitting anything teeny tiny (I’ve been on a knitting vacation since the morning sickness was NOT NICE..but i’m over the hump and back at it!). I missed this one but I’d be happy to test knit for you anytime.